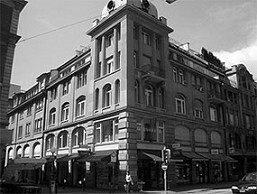 Our offices are conveniently located in the centre of Zurich, only a 7 minute walk from Zurich main station. Leave Zurich main station and walk approx. 300m on the Bahnhofstrasse towards the Paradeplatz. Turn right on the first street which is open to traffic (Uraniastrasse). Then walk on approx. 200m along Jelmoli (which is on your left hand side) towards the Sihlporte. When you reach the first traffic lights which are at the end of the Jelmoli building and also at the level of the restaurant “Golosone”, turn right into the Hornergasse. After approx. 10m turn right again and you will see the entrance to our offices with a company plaque. Go up to the fifth floor. Coming from the main station you can also take tram number 6, 7, 11 or 13 to reach our offices. Get on the tram that takes you towards the Paradeplatz and get off it at the first stop called ‘Rennweg/Augustinergasse’. Walk back approx. 50m and turn left on the first street which is open to traffic (Uraniastrasse). Then walk on along Jelmoli towards the Sihlporte. When you reach the end of the Jelmoli building, cross Uraniastrasse on the pedestrian crossing and walk straight until the restaurant “Golosone” (approx. 10m). Take the first turn to your right into the Hornergasse. Then turn right again and you will see the entrance to our offices with a company plaque. Go up to the fifth floor.